NYC, 02/21/2019, 3:00PM. Mission: Impossible - Fallout (2018): Sixth of the series starring Tom Cruise. 147 min. Director: Christopher McQuarrie. Starring Tom Cruise, Henry Cavill, Ving Rhames. It is the sixth instalment in the Mission: Impossible film series, and the second film to be directed by McQuarrie following the 2015 film Rogue Nation. 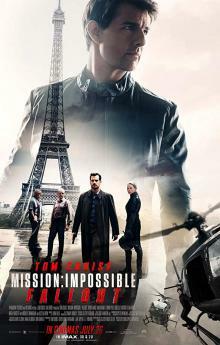 Mission: Impossible - Fallout was a box office success, grossing $791 million worldwide, making it the seventh-highest-grossing film of 2018, Cruise's highest-grossing film to date, and the highest-grossing film in the franchise, surpassing Ghost Protocol.